→This post may contains affiliate links. So now that you have this powdery clay, how the heck do you use a dry clay mask? Below we will show you the simple to use instructions, and some do’s and don’ts too. First, what is the difference between a dry clay mask and a hydrated clay mask? There are a lot of clay masks available on the market. But like a lot of masks available on the market they are “hydrated”. During application you will hydrate your dry clay mask too. In order for a hydrated clay mask to have a decent shelf life for retail, there has to be a preservative. That’s why I love clay masks — NO PRESERVATIVES! Keeping reading more about preservatives found in skincare products below. 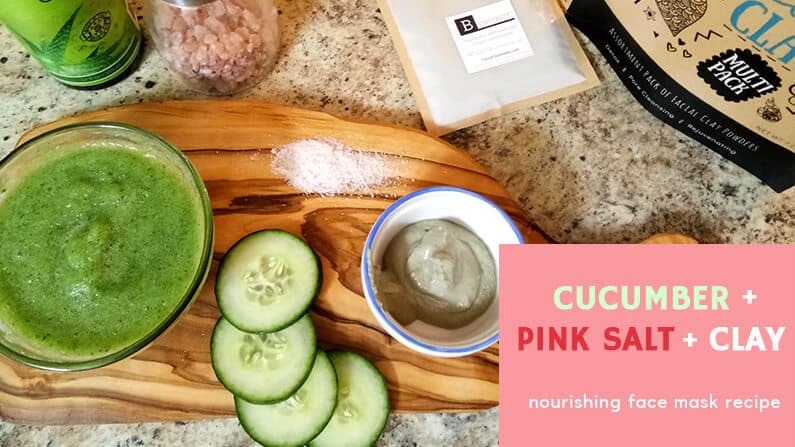 I love love love my clay masks, and feels so great to mix it myself and play around with different recipes to use with clay. But when I first started my clay journey, my first application (actually first many applications), I completely questioned myself. Am I using a dry clay mask right? Was I mixing it properly? Below I take you through the simple step by step instructions to get the best results possible. 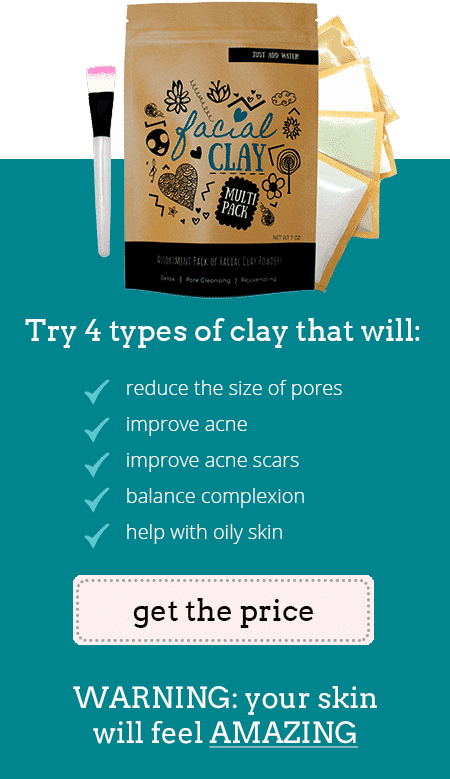 If you are wanting to try a couple of the different clay masks available on the market, our facial clay mask assortment pack comes with 4 of my favorite clays. Is it ok to use a Clay mask Everyday? What is the best time to use a clay mask? Should I apply a clay mask before or after a shower? 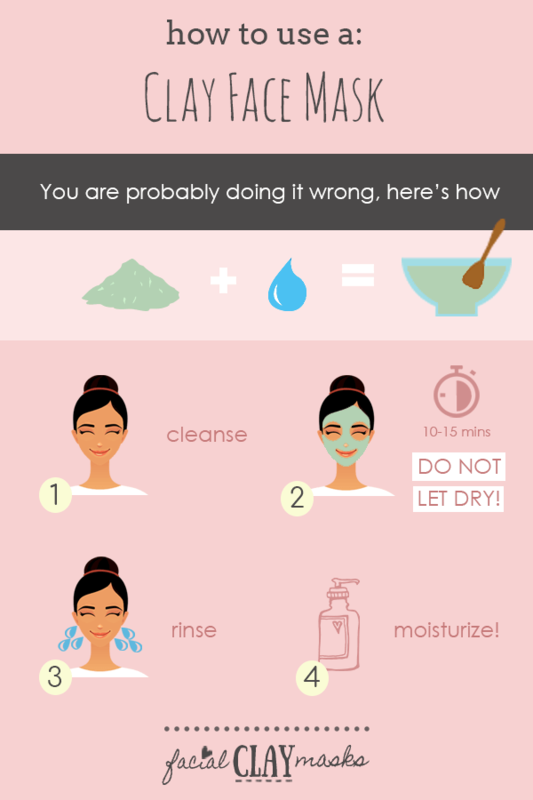 Should you let a clay mask dry? Can I use a clay mask on dry skin? What happens if you leave a clay mask on too long? **Important note: when mixing clay with water, do not use metal. So stick to glass or plastic mixing bowls and spoons. The quick reason for this is because the clay is “energized” and contains a negative charge. When the clay is activated with liquid it will absorb positive charged toxins, like heavy metals. You don’t want your clay clumping to your liquid spoon but to save that energy to work on your skin. Step 1: Start with approx 1.5 teaspoons of clay in your bowl. Step 2: Slowly add 1.5 teaspoon of room temperature or warm water and mix. Some clays need a little less water, equal parts, or a 2:1 ratio. So start with a little and see how it mixes. *Pro tip: filtered water is best. Step 3: Add more or less water or clay as need until you get a smooth clay paste. If you mix too much, that’s ok! Seal in an air tight container and store in your refrigerator to use another time. You can safely store your clay for up to a week. Step 1: Cleanse your face first. Step 2: Using a face mask brush, apply the mask to your skin. Apply first a thin layer of product to your face and neck, then apply a second thicker layer so the mask is approx 1/8″ thick. Step 3: Let the clay sit for approx 10-15 minutes. For sensitive skin types, apply for 5 – 10 minutes. Step 4: Before the clay is almost dry on your skin, rinse it off. Repeat after me, never let the clay ask dry on your face. More on that below. I like to warm my face cloth with hot water and then hold it to my face. This re-hydrates the mask making it easier to remove. Remove all the mask from your face using a cloth. After application of a clay mask, you will feel a tightening effect on your skin. Redness for up to 30 minutes after application is normal. Step 6: Moisturize! I like to apply Jojoba oil or RoseHip Oil. Enjoy your super smooth skin!! Did I mention that our facial clay multi pack, does 25+ mask applications? Here are also some of the most common questions we get about the application and concerns. If I missed any, please leave a comment below! Rule of thumb according to a couple dermatologists asked by bustle, if the masks are hydrating you can use it every day. But wait, clay masks are definitely not hydrating, so how often can you use a clay mask? Because clay masks can have a super strong absorption effect on your skin, it’s often recommended that you use a clay mask 1-2 times per week. You can increase the usage of a clay mask if you ensure that you are not letting the clay mask dry on your skin. Removing it prior to the dry flaky stage, ensures that the clay doesn’t enter the stage of absorbing your natural oils. Make sure to apply a moisturizer following the treatment. I love applying jojoba oil after a mask, which contains Vitamin E and B. Some clays are also stronger than others. 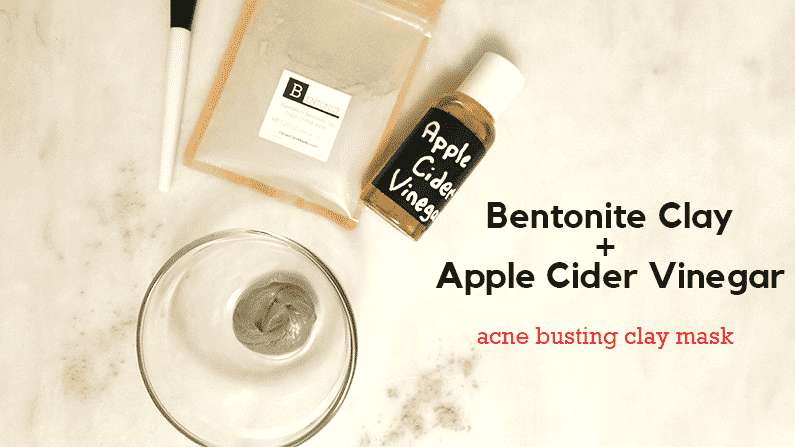 Bentonite you would want to follow the 1-2 times a week recommendations, whereas Kaolin is much gentler on your skin, allowing you to increase the usage. As with any skincare treatment, it’s important to notice how your skin reacts, is it too dry after doing 3 masks a week? How is your skin responding? Masks are a wonderful supplement to your skin care regime. I have found the use of clay masks enough to get rid of my pesky acne and acne scars. It definitely doesn’t get you off the hook for not following a regular skincare routine. Ahem—don’t go to bed without washing your face and expect a clay mask to be your only skincare twice a week. What is the best time to use a face mask? Applying a face mask before bed is my favorite time to relax and unwind for the day. It also helps clear all the built up impurities from your skin and let your skin rejuvenate itself after a mask during the night. It’s not helpful for your skin, to do an amazing clay mask detox, and then immediately put makeup on. If you do a mask in the morning, give your skin a rest for atleast an hour for your pores to shrink back. That is if you wear makeup. I find that I actually stopped wearing makeup after using the clay mask 1-2 times a week for 6 months because my skin was naturally soft and glowing without the makeup. Hydrating masks can be used at anytime of the day, just like they could be used everyday. Should I apply a clay face mask before or after a shower? This is the most common no-no, and the most unknown fact about almost any mask. Almost all my life, I have applied a mask and let it dry till it cracked and flaked when I smiled. This whole time I had been doing it all wrong! First stage is where all the active minerals from the clay absorb into your skin. Second, is where the clay helps to diffuse redness and evens out your skin tone in the initial drying phase. Third phase is where the hydration and natural oils of your skin are absorbed. That’s why it’s important not to let the clay mask dry so that it doesn’t strip the natural oils of your skin. Yes! Each type of clay contains different minerals that are beneficial for different skin types. That’s why we created the facial clay assortment pack, so that you could test out different types of clay to see which works best for your skin type. I also like to experiment with mixing the clays for different skin types as well. For dry skin, you can still find benefit from all of the clay masks but it’s especially important that you do not let the mask dry on your skin, and that you apply moisturizer afterwards. Start by applying a mask, once per week. Then try twice per week and see how your skin reacts. Skin care treatments are not a blanket, one size fits all, so adapt for your needs. What happens if I leave a clay mask on too long? By this point, you have learned not to let the mask dry on your skin. Remove from your skin prior to it becoming dry and flaky. I’m one of those people that often justify if I do something for longer, or the harder way it must be the better way? Also wrong. Many things in life has taught me that. But what will happen if you leave a clay mask on too long? I have done this (by accident of course) I got so distracted in an article I was reading that I completely forgot the mask was on my face. I think it was probably on there for 30 minutes or more. It was crusted and dry, and started to get uncomfortable. After I removed the mask, my face was red. Some redness after a mask application is normal, but I was really, really red. After about an hour, the redness did go down. My skin was perfectly fine after my skin went to work replenishing the natural oils back to the skin. A process that takes approx 45 minutes (can’t remember the source where I read that one). However, I have super oily skin. You can cause serious over-drying to your skin. So let’s not discuss the what-if scenario, just don’t. 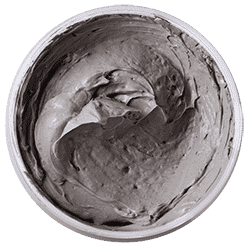 Why does a hydrated clay mask need preservatives? I’m kind of obsessed with clay masks 😛 One of the main reasons is because it’s one of the very few ways I can use an all natural face product — that works. There are a lot of other brands that have caught onto the fact that clay masks work. Clay has been used in skin care since the 18th century! When adding water to clay and to extend the shelf life of the product, preservatives are a must. Not all preservatives are bad, like honey or essentials oils, but when preservatives like formaldehyde and phthalates are used the potential side effects can be nasty. Parabens are by far the most popular preservative for cosmetic use. According to WebMD, even trace amounts of parabens in your body can spur the growth of certain types of breast cancer cells. I use clay masks to remove harmful chemicals, not add more. Many of the recipes we create are made to be single serving use or stored in a refrigerator and used within a week to avoid the use of preservatives. What questions have you had while mixing and applying your clay masks? Comment below! Other readers probably have the same question. Coming soon! 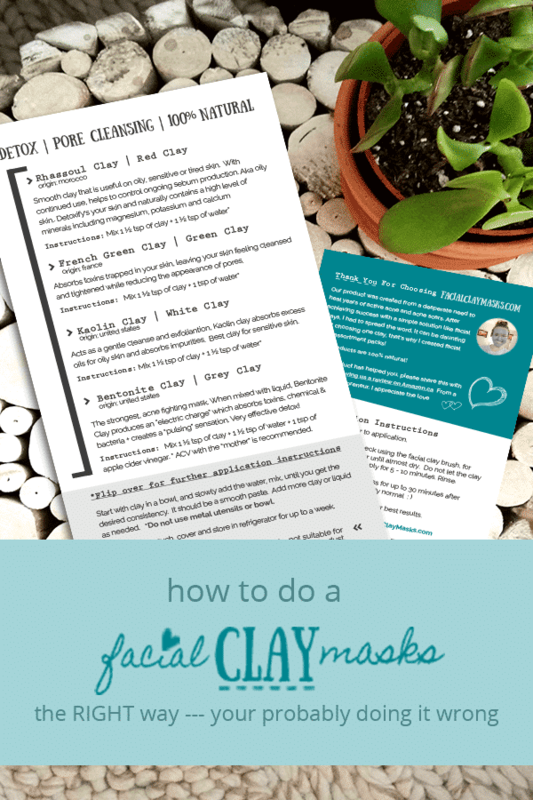 Get FREE access to our upcoming E-Book with exclusive clay recipes.